I have to admit that I am not much of a fan of cover albums. For the most part, cover songs never surpass or even match the quality and magic of the original. In fact, most cover songs only motivate me to pop the original in my CD player. Despite what I’ve just said, I wanted to take a look at this album with an objective ear and come up with an objective review. Even though my interest in tribute albums and cover albums is not very high, I’ll say that this is a good album. As you can tell, Silver Dollar are fans of Iron Maiden and especially big fans of Ozzy Osbourne. Perhaps that is because the singer has a voice very reminiscent of the Madman himself with a little Sebastian Bach (Skid Row) thrown in. He nails Ozzy perfectly, especially on Crazy Train and he can pull out a lower, gritty delivery ala Bach at times too. The vocalist will certainly be a shining point for this band. I also like the Iron Maiden covers as well: outstanding job with the dual guitar leads! 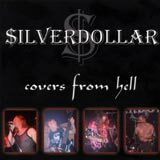 The guitar work of Silver Dollar is impressive throughout this album as there are some extra solos thrown in most of the songs to mix things up a little. Aside from some variation in guitar solos, the band stays pretty true to the original songs on this album. While none of the Silver Dollar versions of these songs outmatches the original, they are all technically very well done. The only complaint I have is one that can be expected from a self financed release: the production. I’m sure this will be corrected once the band secures a record deal and receives a recording budget. The drumming is the only major deficiency as far as production goes. The drums have a very tinny sound to them, very raw and unpolished. Like I said though, the point of releases like this are to secure a record deal and make fans aware of their presence and so lesser production can be forgiven at this stage of the game. For those of you eager to discover quality up and coming metal bands or who like well done cover songs, you will be impressed with this release. These guys have the talent to produce a quality release: especially when it comes to the guitars and the Ozzy-like vocalist. Now that we know this band has talent, let’s see if their song writing skills are good enough to create some good original songs and if they can find a producer to bring their sound to life. I look forward to their next release….